En todos los lados de la propiedad hay tierras agrícolas así que se siente como si estuviera en una enorme granja. Justo al final de la calle se puede comprar huevos frescos de granja (delicioso), o pollo o carne orgánica planteada allí donde se lo ve! I have nothing but positive things to say about this terrific place and its attentive owner. My wife and I stayed here for a bit over a week in early September with our newborn--our first lengthy trip away from home since he was born--and it was exactly what we needed. The property is exactly as described in the listing: a beautiful farmhouse with historical detail intact, lush and well-maintained grounds, and one of the best pools (saltwater, huge, and warmed perfectly by the direct sun in that part of the yard) that we have ever had the pleasure to get to know. The indoor living spaces were comfortable, the kitchen was functional and well-equipped, and the outdoor spaces were fitted out for maximum relaxation. The surrounding area was just as described in the listing: the house is on a substantial parcel of land, surrounded by fields in every direction, and tucked onto a side street with easy access to the North Fork's two main roads and all they have to offer (amazing farmstands, local fishmarkets, vineyards, and easy access to Greenport, Shelter Island ferry, etc.). Special kudos to the property owner, Aaron, who was helpful and communicative throughout, and who went above and beyond to make our stay comfortable. When he heard we were traveling with a baby, he went out of his way to make sure the house was set up with all sorts of baby-related extras to make our stay as easy and comfortable as it could be. His attention, and his great place, made our stay here peaceful, relaxing, and restorative--just what we needed! We definitely recommend, and hope to be back. We really enjoyed our time at Aaron’s home. The house and backyard were exactly as-pictured on VRBO. Our favorite part was the pool and backyard, both of which were large, clean, and private. The AC and appliances worked well (laundry, grill, coffee maker, etc.). They’ve also added a beautiful, spacious, sun-filled addition to the back of the house where we enjoyed eating dinners or curling up with a book. Aaron made accessing the home an easy and flexible process. He was available via email if we had questions/concerns. The home is well located - a short drive to Southold, Greenport, Love Lane, and various farm stands/points of interest in the North Fork. Definitely recommend. This house was in the perfect spot for exploring the North Fork and the hosts were proactive and responsive - we had a great stay! My husband and I spent three weeks here with our three month old son while on parental leave. Before confirming our booking, the host was proactive in letting us know about the property and ensuring it was a good fit for what we were looking for. Knowing we were there with our newborn son, they offered to provide a few baby items (bouncy chair, playmat, travel crib) to help cut down on our packing and when we arrived the house was stocked with all the essentials for our stay. The hosts continued to be very responsive throughout our stay whenever we reached out. We loved how close the house was to Mattituck (great breakfast/lunch spots and a Starbucks), Greenport for great lunches and dinners and a quick ferry ride to Shelter Island, and the many wonderful North Fork vineyards. We found the house pretty much as pictured - beautiful and private backyard, nice dining space, cozy bedrooms. As others have mentioned, it is an old farmhouse and is furnished with some antique furniture - it was fine for us, but might not be everyone's style. We spent most nights grilling fish from the local fish market (5 min away) and eating outside or in the dining room. We also loved the comfy TV room, where we had morning play time with our son, and could watch Amazon/Netflix in the evening with the Firestick. Overall, we were very comfortable staying in this home and getting to explore the area. Wow! What a gem! 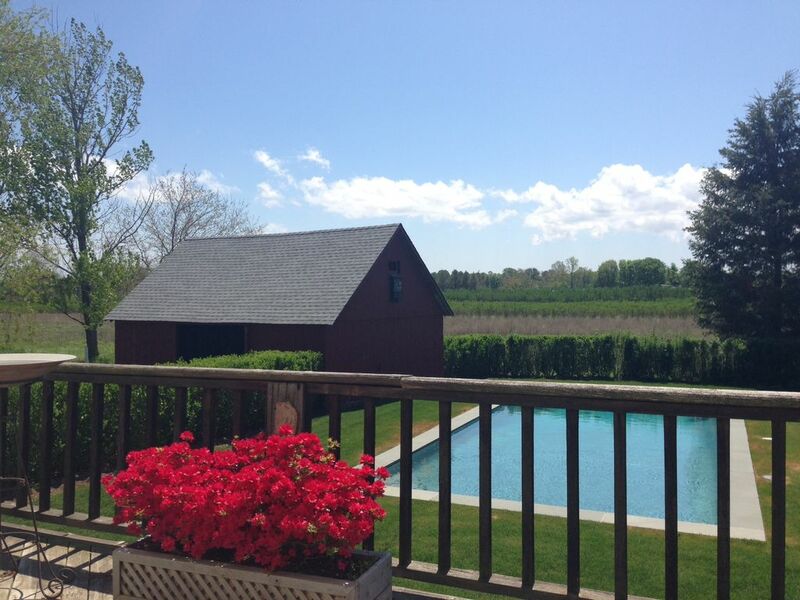 My husband and I have been looking for a charming North Fork getaway. After an exhaustive search, we came upon the 1820’s Farm House in Cutchogue. We wanted a place with rustic charm and original details, as we are period design buffs. This charming home did not disappoint. We loved the farm kitchen (which was immaculate and freshly painted). We loved the original clawed bathtub and wide plank floors, not to mention the endless vista overlooking beautiful North Fork farms in full spring bloom– a very private feeling. It also boosted every modern amenity, even if you are not as into “the old world charm” such as remote controlled air conditioners/heaters in every room, Internet and cable television, Amazon Prime and Netflix, which came in handy when my teenage nephew came to visit. The owners were lovely to deal with. When we inquired where to buy meat for a dinner party, they couldn’t have been more helpful to give us a couple of great recommendations. We ended up with a delicious bone in filet from Lombardis, a fully stocked Italian specialty market and butcher nearby. We really wanted for nothing during our visit; the bathrooms were fully stocked with clean towels, soaps, shampoos and conditioners. The owners were kind enough to leave a fantastic list of recommended restaurants and wineries which we sampled. Our only regret is we came too early in the season to see the beautiful pool open, but we are already looking to book our return with my sister and her family for a reunion later in the summer months. I whole-heartedly recommend this home for those with an appreciation of charm in the heart of the North Fork. This property has a lot of potential and the owners were very easy to deal with and very nice, which makes it difficult to write this review. Our rental was a disappointment because this house was dirty, which caused us to spend as much time away from it as we could. The furnishings and decor are a very nice eclectic mix and the house is stocked with every accessory imaginable, but unfortunately there is a layer of dust on everything. The bedrooms, living spaces and bathrooms were on the border of acceptable for a 3 star motel, which is not consistent with the price we paid. This could probably be remedied by a better cleaning service. The real problem was the kitchen, which was grimy and greasy and unusable. My family had planned to shop at farms and cook lovely dinners but unfortunately we had to eat every meal outside the house. The kitchen is outdated and tired, which is obvious from the photos, but the real issue is the dirt. The stove had caked on grease. The tin backsplash is all rusty. The countertops, including the built in cutting board, was sticky and brown. The oven and toaster oven were crusty inside. There were multiple coffee makers, one dirtier than the other - thank god for the local coffee shop. And while there were many pots, pans, dishes, glasses - they were all filmy with caked on gunk. And there were spiderwebs in the drawers, on the utensils. The floor was filthy, causing brown sock bottoms. The refrigerator and freezer were filled with half eaten and expired food when we arrived, and the cabinets were stocked with someone else's groceries. I spent the first day of my VACATION trying to clean the kitchen, but it was beyond what could be fixed in a day. I let the owner know, and he did offer to have the cleaning service come back, but this kitchen is beyond what could be fixed with a few hours of "wiping down". This kitchen needs to be emptied, steamed and scrubbed for a week. Additionally, there was some issue with the garbage service, so weeks of trash were in the barn and the animals were having a field day in there. My husband was grossed out to even throw out the trash. The neighborhood was lovely. The pool was very nice. However, we planned to rent this adorable farmhouse to relax and enjoy the quiet country and ended up using it only as a crash pad. This guest was extremely difficult to deal with. She seemed angry from the get go. When she informed us that there were some of our personal coffee makers that were dirty (newer clean one was left on the counter for tenant use) we quickly offered to send our cleaning staff over to stay with her for as long as she wanted to remedy the situation. She refused, and persisted to complain. We were willing to do almost anything, to make this guest feel more comfortable. But she refused any efforts. The house is a classic, rustic, North Fork farmhouse dating from 1820. It is surrounded by farmland on all four sides. Dust can get it, however, it is not dirty. If Hampton chic, grey, white perfect is what you want, this house is not for you. We do not push tenants to write reviews. We have had many tenants who have had a wonderful experience and often asked if they can stay longer. Sometimes, people are just unhappy individuals. If you rent to this tenant, be prepared for a very unpleasant experience. Our stay was consistent with the prior review. The owners were wonderfully hospitable, courteous, and responsive. The property was entirely as described. The pool and the grounds were beautiful. The house is older and a bit quirky but not without charm. I would wholeheartedly recommend the property to a friend or family member.